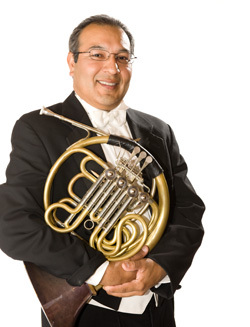 Victor Valenzuela is currently Third Horn with the Tucson Symphony Orchestra. As well as holding this position, he is also Instructor of Brass at Pima Community College. Mr. Valenzuela holds Degrees from New Mexico State University and Northwestern University. His Instructors have included Julie Landsman, Dale Clevenger, Nancy Joy, Dr. Warner Hutchison and Richard Lambrecht. He has performed with The Royal Philharmonic Orchestra of London, The Phoenix Symphony, El Paso Symphony, Flagstaff Symphony, Santa Fe Symphony, Boulder Philharmonic Orchestra and the Arizona Opera. He has toured with the National Symphony of Mexico during its 2002 North American Tour. Mr. Valenzuela has performed for the Opening and Closing Ceremonies of the 1984 Olympic Games, the 1986 re-opening of the Statue of Liberty and the 1988 Celebration of the Declaration of Independence. In July 2000, Mr. Valenzuela performed, along with his Colleagues of the Tucson Symphony Horn Section, at the International Horn Society Conference in Beijing, China. Mr. Valenzuela is a performing artist and member of the Paloma Winds at the Music for Greer Chamber Festival. His hobbies include Golf and more Golf. The three loves of his life: his wife Susana and their two boys Christopher and Alex. When did you start playing the French horn? At age 13, but I played other instruments as early as age 5. Are you from a musical family? Yes! My father was a band director and all of his brothers and sisters played an instrument. What makes your instrument special? The horn is the most beautiful sounding instrument I can think of. So many colors and ranges. What advice would you give to aspiring horn players? Have fun and have patience. Good things come from extreme patience! Most exciting musical moment: Performing in Carnegie Hall with the National Symphony of Mexico. What would your career be if you hadn’t become a musician? Maybe a golfer or a music director. Hobbies: Golf, and hanging out with my two boys. Hometown: Born and raised in New Mexico. But I sure love Tucson!